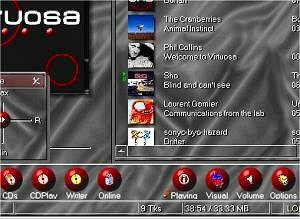 Virtuosa all-in-one music and movie jukebox ! Download Virtuosa: the utlimate all-in-one music and movie software jukebox ! [Homepage] - by: FunVibes Sarl - Download Virtuosa all-in-one music and movie jukebox ! Purchase Virtuosa all-in-one music and movie jukebox ! O Download Virtuosa, the ultimate all-in-one music and movie software jukebox to rip, import, play, burn, mix, convert, organize, normalize, visualize, print and enjoy music and movies. Burn 1000 tracks on a DVD, convert audio files,... 6 languages ! See above information and user's reviews about Virtuosa all-in-one music and movie jukebox ! Download Virtuosa: the utlimate all-in-one music and movie software jukebox !